Eggs & sausages cooked separately. Sorry, you’re on your own. Two medium white skinned potatoes, diced into centimeter squares. Leave the skin on. Heat two tablespoons of fragrant olive oil in a skillet. Toss in the potatoes. Scissor-snip the greens from three rosemary branches over the potatoes while they cook effortlessly (no stirring just yet). Once the bottoms are nice and golden flip the potatoes, and then ‘Do Not Disturb’ them until they’re brown on the other side. 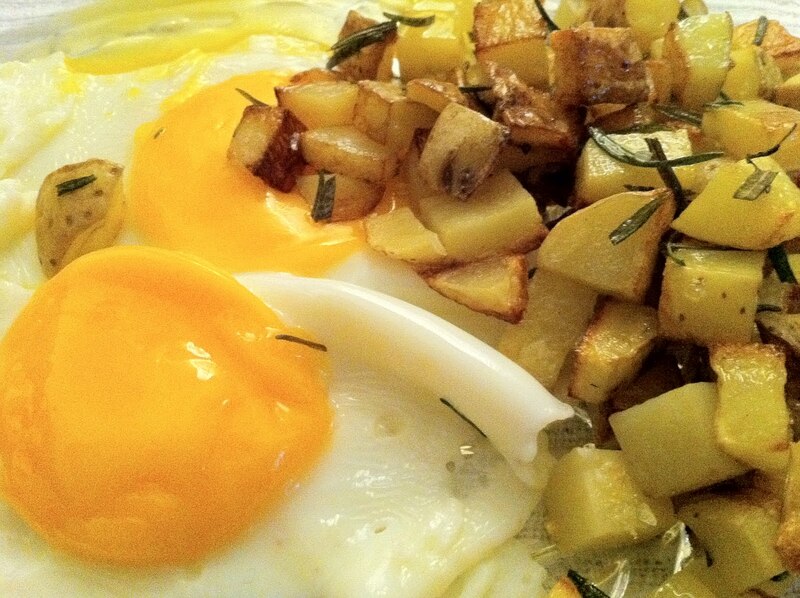 Only after they’re thoroughly cooked, can you start cooking your eggs in a separate skillet, while now stirring the potatoes from time to time. Sprinkle with giant sea salt. Serve *HOT*.